Freerice.com is a website that I used in my classroom last year that donates rice to help end world hunger! Students love answering questions on this web site. The questions on the free web site include vocabulary, art, chemistry, English, geography, language, and math. 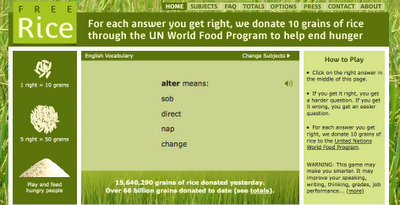 For every question the student answers correctly, the UN World Food Program will donate 10 grains of rice. This may not seem like a lot, but at the same time your students are playing the game, thousands of other people are playing it at the same time! 1 out of 6 people do not get enough food to be healthy - that is over 1 billion people on Earth.